Instructions for installation of the PT100SA Surge Arrestor. 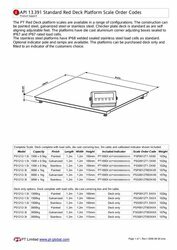 Ordering information for Australian Approved Red Deck Platform Scales. Basic setup of the PT600R for printing from the serial port. Additional information for PT Serial Cables for connection to indicators and transmitters.